People use liquid soap in many forms. You can use it as dishwashing liquid, liquid detergent or liquid hand soap. 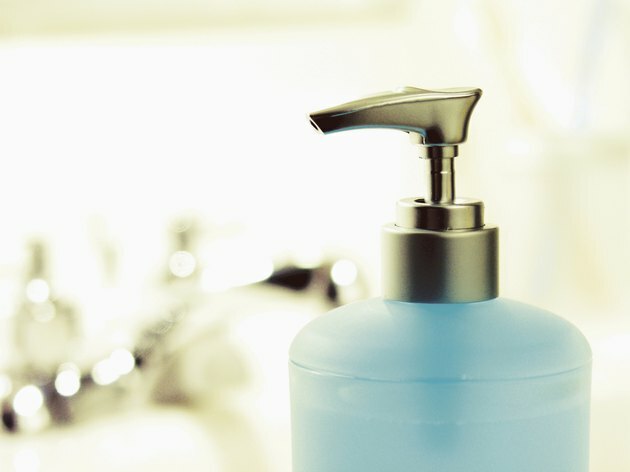 Ingredients in liquid soap act as de-greasers and stain removers and produce suds for lather. When combined, liquid soap ingredients produce a cleaning agent to wash dishes, hands or clothes effectively. Liquid dishwashing soap, liquid detergent and liquid hand soap include the following ingredients: abrasives, alkalis, antimicrobial agents, antiredeposition, bleaches, colorants, corrosion inhibitors, enzymes, fragrances, hydrotropes, opacifiers, preservatives, processing aids, solvents and suds control agents. Abrasives act as a scrubbing, smoothing or polishing agent. Alkalis balance the acidity of the other ingredients by increasing the performance of surfactants, builders and alkalinity. Alkalinity removes acidic, fatty and oily buildup. Antimicrobial agents kill disease-causing microorganisms. Antiredeposition stops dirt from resettling after wash removal. Bleaches lift, lighten and remove set-in stains. Bleaches are also a disinfectant. Fragrances cover over basic ingredients, eliminate dirt odors and identify the product. Suds control agents include stabilizers and suppressors. Stabilizers activate the cleaning power of suds, and suppressors control foaming if interfering with cleaning. Suds control agents determine foaming capabilities of the product. Enzymes break dirt down into simpler forms for easier removal of soil. In laundry, enzymes reduce pilling and graying effects on clothes and articles made with cotton. Enzymes will also remove embedded soil. Colorants are pigments or dyes that identify the color of liquid soap. Corrosion inhibitors protect metal machine parts, finishes, china patterns and metal utensils. Hydrotropes keep the product homogenized, preventing it from separating into layers. Opacifiers make the product opaque. Preservatives stop natural effects like aging, decay and discoloration from occurring. Processing agents form stability and ensure proper flow and uniform density. Processing agents are also a part of the manufacturing process.